Definitions on this page are drawn from the first edition (1755) of Samuel Johnson's Dictionary of the English Language. This is not a representative sampling, just a small selection of some of the more amusing entries. 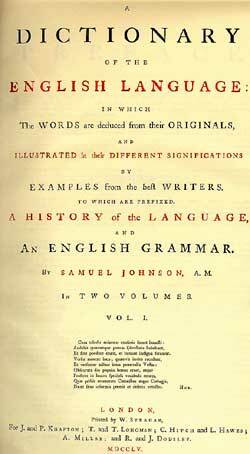 The list below might lead you to think that Johnson's Dictionary is some bizarre collection of witticisms and oddities, but nothing could be further from the truth: on the whole, it is a very sensible book, and it stood as the standard for over a hundred years.